There are several volcanoes close to Antigua. A couple of the volcanoes are popular destinations for day hikes, most hikers sign-up with a local tour company. All of the hotel in Antigua can arrange for you to go on a overnight or day tour to one of the volcanoes. Be sure to come well prepared with closed-toe hiking shoes or boots; you'll also want to bring water, a warm sweatshirt, and rain gear. Finally, if you're going on one of the later tours, be sure to either bring a flashlight or make sure your tour agency provides one. Before you go, get current safety information, in terms of both volcanic and criminal activity, from your tour agency, INGUAT, or the Antigua tourism police. It's sometimes possible to camp here, which is your best chance of seeing the nighttime lava show. About an hour-and-a-half from Antigua is the country's, and Central America's, most popular volcano - Volcán Pacaya. Rising to 2,552m (8,370 ft.), Pacaya is in a near continuous state of eruption. Most ascents of Volcán Pacaya begin at San Francisco de Sales, where you must pay a national park entrance fee. From here you'll hike for about an hour-and-a-half to reach the base of the crater's rim, where the steep hiking trail gives way to a solid slope of loose debris made of lava rocks and ash. This final stretch is steep and can be a arduous stretch, with loose footings and many mini-rock slides - don't climb directly behind anyone else in your group. On the way down, more adventurous hikers can "ski" down. Those who make it to the summit will encounter an otherworldly scene of smoke and gas, with the occasional volcanic belch. Some of the rocks will be very hot to the touch. Very infrequently, Pacaya will let loose with a spectacular eruption. When the skies are clear, the views are amazing. Although higher than Pacaya, the 3,760m (12,333-ft.) Volcán de Agua is actually an easier ascent. It's also decidedly less exciting, in large part because Volcán de Agua has been dormant since the mid-16th century. It's Spanish name traces back to 1541, when water and mudslides from the volcano wiped out Guatemala's then-capital city, today known as Ciudad Vieja. The hike to the summit of Volcán de Agua leaves from the town of Santa Maria de Jesus. The hike is relatively gentle and should take about 4 to 5 hours from Santa Maria to the summit. The hike down is somewhat quicker, but care should be taken. 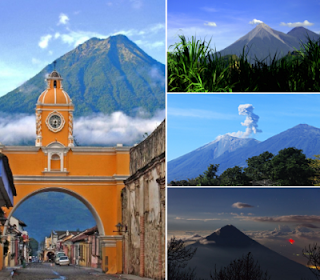 The tallest of the volcanoes around Antigua and the third tallest in Guatemala, Volcán Acatenango has two main peaks, Pico Mayor and Tres Marias. Pico Mayor is the taller of the two and peaks out at some 3,975m (13,040 ft.). Tres Marias, or Tres Hermanas, rises to 3,880m (12,730 ft.). Acatenango is a dormant volcano, though it does have several small craters spewing sulfur gases. Acatenango is very close to Volcán Fuego, and the two are actually connected by a high ridge. This is the best volcano hike in the area for your money, providing spectacular panoramic views on clear days. However, the ascent is long, taking most climbers between 5 - 6 hours; overnight trips are common, and can sometimes be rewarded with a nighttime show from Volcán Pacaya. Volcán Fuego, one of Central America's most active volcanoes, ascents never get very close to the crater and are completely dependent on current volcanic activity. Fuego's last significant eruption was as recent as 1974, producing spectacular pyroclastic flows visible from Antigua. Fuego stands some 3,760m (12,350 ft.), though its exact altitude can sometimes change due to volcanic activity.